JBQ mud agitator is a part of solid control system of mud tank, which is mainly used in agitating and blending drilling fluid so as to control the depositions of solid particles in its tank cycling system and keep the mud property of circulation stable and mixture uniform. GN solids control manufacture drilling mud agitator with various models, different agitator use different motor. The model we have now including JBQ5.5(7.5HP motor), JBQ 7.5(10HP motor), JBQ11(15HP motor), JBQ15(20HP motor), JBQ22(30HP). Mud agitator is consist of gear box and motor, shaft, impeller, stabilizer( option), etc. Motor is a main part of drilling mud agitator. Usually we use explosion proof motorYB2 series for mud agitator. If the installation dimension of the motor is same, it can be fit for the gear box, whatever the brand is, whatever the manufacturer is. We also provide ATEX certified explosion proof which can be used in hazardous field zone 1, and Ex-approved for use in Zone 1, Ex de IIA T3. 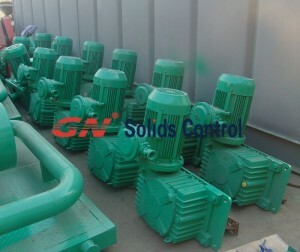 If you need electric motor and gear box for 75HP, 10HP, 15HP, 20HP agitator, pls contact GN sales.